Many years ago an unknown pioneer decided that a wood floor would be a big improvement over dirt and ever since hardwood flooring has been one of the most popular choices. In addition to the natural warmth and beauty that only a natural product can provide, it also adds insulation properties to your room. 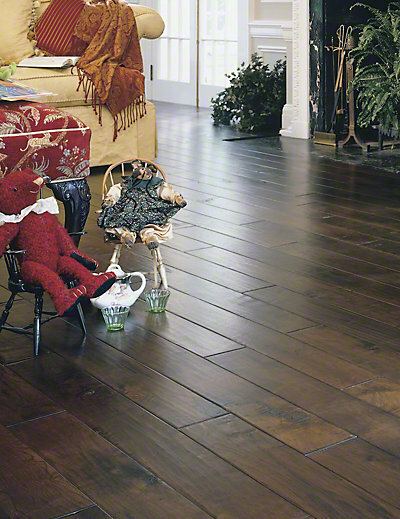 Hardwood flooring is available in either a solid or engineered construction. Engineered products are constructed with only a top layer of the wood species and cannot be refinished as many times as a solid product. However they are priced less and can be installed over concrete. One of the biggest benefits over other types of flooring is that hardwood can be sanded and refinished to provide many years of performance. Don’t see the brand you are looking for? Contact us!